George Downing from Tennessee built this Rickenbacker-style 12-string bass in 2006 using the neck and electronics from a Galveston 12. 2006 Rickenbacker-Style 12-string bass, shown here with the original Galveston headstock. “The neck is bolted on. I considered gluing it in but was not confident that it would hold with all those strings. If I were to build one from scratch I would probably make a neck thru. What a huge sound! It really sounds like it has a chorus pedal on it. I'm gonna have to make me one someday. It's just too much fun to play!" When asked whether he worried that Rickenbacker might object to his use of one of their body styles, George responded, "I'm not too worried about what Rickenbacker might think. If they built a 12-string bass, this guy would have gladly sold two or three of his guitars to buy one. But they don't, nor do they seem to have any intention of doing so. In fact he inquired, and got a rather humorous response. something to do with a fish suspended by a dozen mono-filament lines. 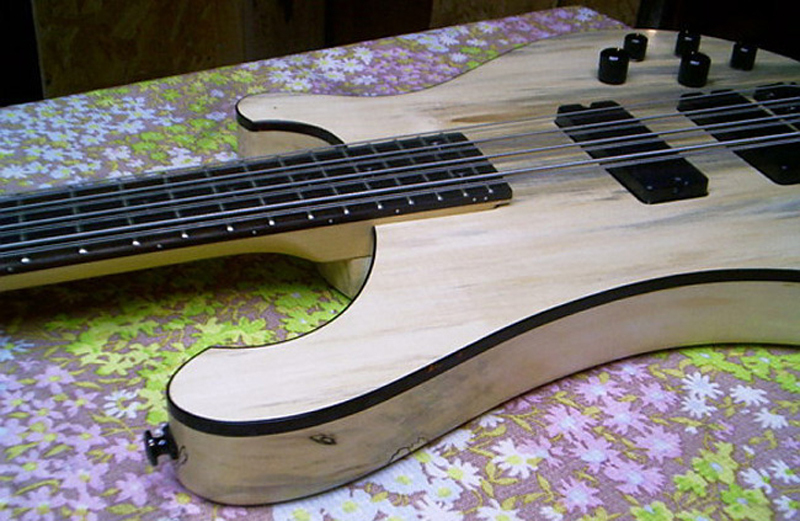 Also, the construction is almost entirely unlike that of a Rickenbacker, except for the fact that it's made of wood. To top it all off, I received no money for it, just did it to build my chops, as it were. In fact I think I spent about 25 bucks on binding, glue and sandpaper, so if Rickenbacker really wants a piece of the action, they can send me a fiver."